EuroSpec is focussing on the domain of passenger rolling stock for use on the heavy railway network in Europe. EuroSpec is not a standardization body, but an organization which provides common, functional and harmonised specifications for rolling stock system and components from the perspective of European Railway operators. In the European standardization process the harmonisation from users perspective is important for the success of the final sector standard. EuroSpec fills the gap of missing harmonized specifications in the voluntary domain. EuroSpec is the sole entity representing a selection of European passenger operators, the voice of operators in Europe. 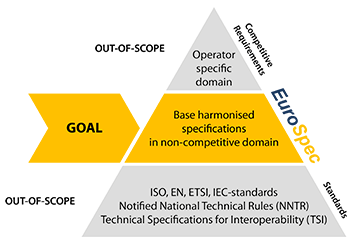 CEN, CENELEC and ETSI are the mandated standardization bodies in Europe (ligned with the Regulation(EU) No 1025/2012). These define common standards based on the expertise from manufacturers, users and other well-knowledge experts from the Member states. EuroSpec does deliver contribution to the European standardization process by collecting and harmonizing the specifications form operators’ perspective. 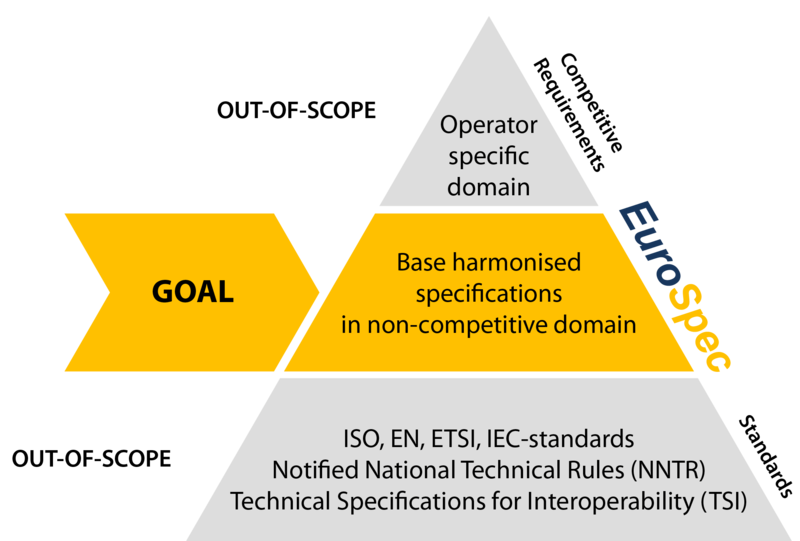 EuroSpec won’t duplicate work of existing CEN or CENELEC standardization groups. An EuroSpec can be a starting point of a new EN-standard. EuroSpec isn’t linked to the regulatory framework of the railway related European Directives. EuroSpec leaves the development of rolling stock and its systems and components fully up to the manufacturers and suppliers. EuroSpec has a MoU with UNIFE. The draft final versions of a new EuroSpec will be reviewed by UNIFE-members. EuroSpec won’t duplicate work of existing UIC leaflets / IRS or ongoing work. No link with UIC organization. CER referred to EuroSpec in their recent paper. EuroSpec is already be seen as established. EuroSpec has a required position in the landscape. EuroSpec fills a gap in current standardisation landscape by harmonising the requirements from the train operators perspective; EuroSpec is a mean to obtain mature products needed to offer excellent products to the end customers.